Obviously broccoli is not in season this time year so if you can’t get fresh, frozen will do. I was in the mood for Cream of Carrot Soup when I saw a pretty head of broccoli in the fridge that needed to be used soon. 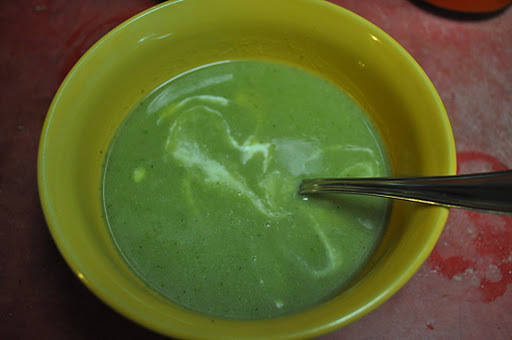 I like broccoli, I like soup so why not Cream of Broccoli soup. In this recipe, I use my fermented garlic paste which I add to the individual cups along with sour cream so you are getting some probiotic goodies with each cup. According to nutritiondata.self.com, broccoli has no saturated fats and no cholesterol. You can easily remedy that by adding sour cream because we all know many vitamins are best used by the body when they are accompanied with fat. Mmm, fat. Silly nutritiondata.self.com! Someone should let them know saturated fat is good for them. 1 medium head of broccoli, chopped up stalk and all. In a medium sized sauce pan, add stock and broccoli. Bring to a boil, turn down and let simmer until broccoli is tender, about 10 mins. Using an immersion blender, puree soup to a smooth consistency. Add salt to taste. In each bowl stir in a spoonful of sour cream and about 1/4 tsp of garlic paste. Easy peasy lemon squeezy and my 11 yo says. This looks so good and loaded with nutrition! I'm so with you on the fat thing! I add fat to everything. I bet sour cream would taste so good with this soup! Thanks for sharing this with Sunday Night Soup Night, look forward to seeing you again soon!